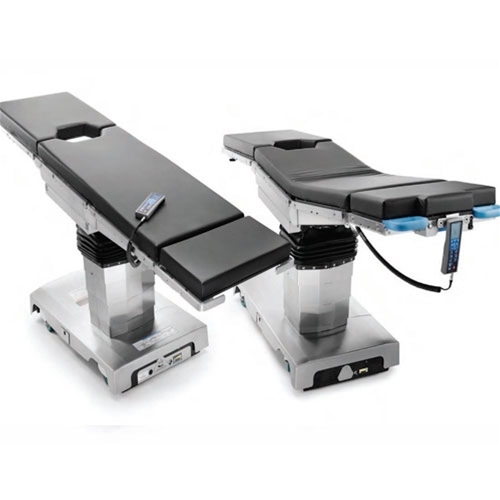 The Steris 5085 SRT is a crossover table that slides, rotates and transports patients throughout the perioperative area and is the only surgical table cleared by the FDA for patient transport, according to the company. A drive wheel allows one caregiver to safely transport a patient from pre-op to OR to post-op without red zone gurneys or trolleys. In pivot mode, the drive wheel locks and rotates 360 degrees, without support posts or weight calculations. An intuitive hand control with an LCD window telegraphs table-positioning data and allows one-touch patient posturing. The four-section tabletop articulates to a variety of patient postures. The 5085 table can be upgraded to the SRT at any time by adding the drive wheel and head section. Both tables are configured to enable ACT (Advanced Control Technology) software and are compatible with previously purchased STERIS accessories. The hand control’s LCD window telegraphs table positioning data to caregivers, even in a darkened room. 1200 lb (544 kg) load; with the ability to rotate and raise/ lower table but no tabletop articulation or slide. 1000 lb (454 kg) load; with the ability to rotate and all patient posturing but without the tabletop slide. 600 lb (272 kg) load; with the ability to rotate, all posturing, transport feature and tabletop slide.